Hello, lovelies~ It's been a long time since I posted an entry to my blog. I have been enjoying the Idul Fitri holiday, especially the empty roads. That is such a treat during this holiday. Anyway, back to the review. 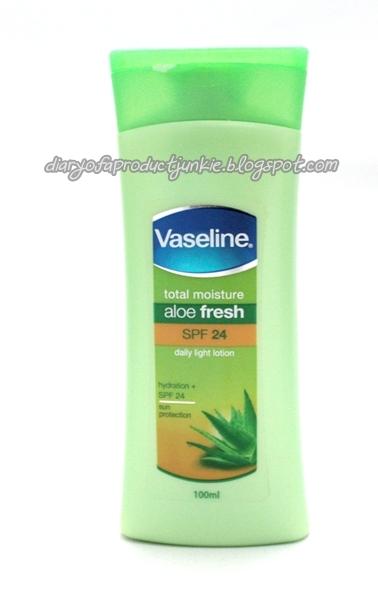 Today, I wanted to review a product from Vaseline called the Aloe Fresh moisturizer with sunscreen protecting factor. The packaging is similar to most Vaseline products in a green flip cap with a light green body. The bottle I have is a 100 ml in size. I think the design label is simple and informative as it has aloe vera leaves on the low right corner. 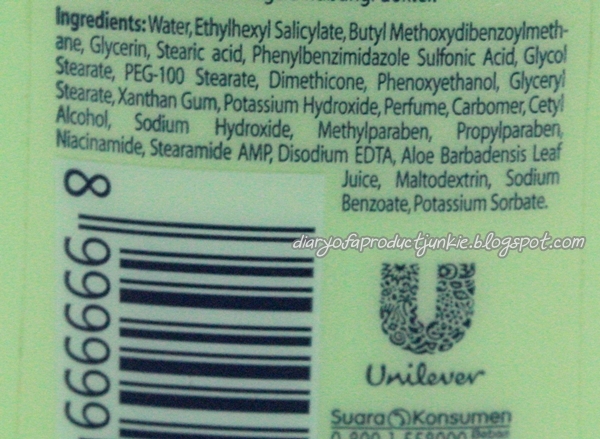 It also has a description of the ingredients and information of the product on the back of the label. This moisturizer uses chemical sunscreen of Ethylhexyl Salicylate (UVB protection), butyl methoxydibenzoylmethane (UVA protection), and phenylbenzimidazole sulfonic acid (UVB protection). As preservatives, it uses phenoxyethanol, methylparaben, propylparaben, sodium benzoate, and potassium benzoate. It still has perfume listed as one of the ingredients, so people with sensitive skin may want to be extra careful with it. This sunscreen or daily light lotion contains aloe vera leaf juice that may help to soothe and care for the skin. I bought this at a supermarket in Kelapa Gading, forgot the exact price, though. Sorry~ Anyway, the sunscreen has a white lotion texture that is easily blended all over the body. It has a sunscreen protecting factor (SPF) of 24 and a photoaging (PA) protection of ++. It is covers both UVA and UVB protection as listed on the paragraphs above in the ingredients section. Unlike other sunscreen, this one spreads easily and smoothly all over my arms and leg. It doesn't have a sticky or greasy finish as well. This is probably one of my favorite drugstore sunscreen, but I don't wanna jinx it. Overall, I like the lightweight, non sticky and non greasy finish of this sunscreen on my body. It is also affordable and easily obtained in most drugstores/supermarket in Jakarta. 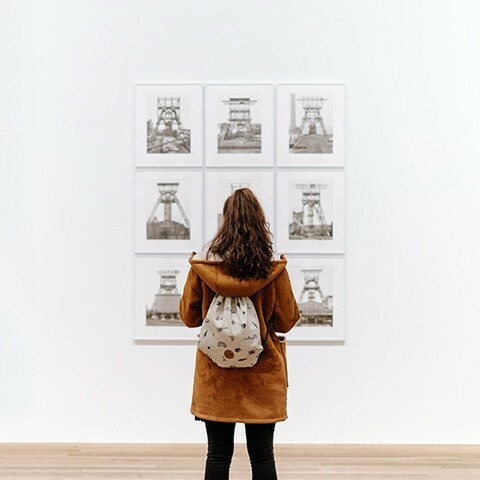 However, this may not be for you if you are looking for a physical sunscreen, ones that have zinc oxide and titanium dioxide. If you don't mind the chemical sunscreen, then go out and find this in your nearest drugstores! I love vasline body lotion too. and i am currently using a body lotion from vaseline! !cheap yet good!! I cant find this specific lotion. I can only find the vaseline aloe fresh spf 15 one. Which drugstore did you get it from? 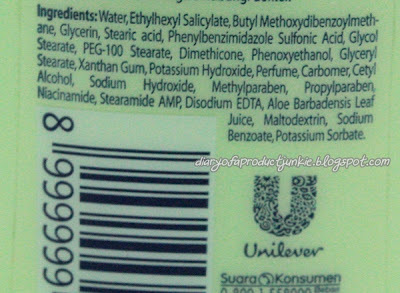 This lotion is available at many department stores but if you can’t find it, you can shop for it online.